Risotto Rice + Siracha = a unique fusion of Thai and Italian ingredients. It has a creamy consistency and an appealing coconut and chili spice flavour. Made from the best quality Italian Carnaroli rice, coconut milk powder and Siracha seasoning, a peppery Thai condiment containing red chili peppers and garlic. 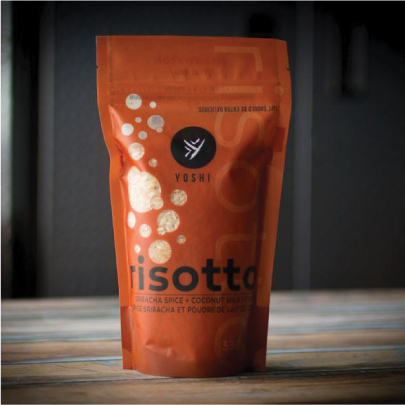 Risotto Rice with Siracha is a delicious accompaniment to grilled chicken, fish or seafood. carnaroli rice, coconut milk powder (coconut milk solids, maltodextrin, sodium caseinate (from milk), sodium phosphate), sriracha seasoning (Powdered sugar, bell pepper powder, chili powder, corn maltodextrin, salt,paprika, garlic powder, dextrose, tamarind powder, rice concentrate, natural flavours, modified food starch,may contain 1% or less of distilled vinegar, molasses, corn syrup, caramel color, sugar, spices, tamarind, sulfiting agents, silicone dioxide). Contains sulphites.